I have so many memories of my childhood tied to food… and more specifically… CANDY! I love candy but now that I’m adult I don’t eat it that often. When I do there’s a pretty good chance it’ll be Twizzlers I’m eating. I have many memories of Twizzlers. Most of them are centered around Saturdays in the Fall. That’s when I’d tag along with my Mom to get groceries in a neighboring town about 20 minutes away. We’d run errands and load up on groceries for the week. 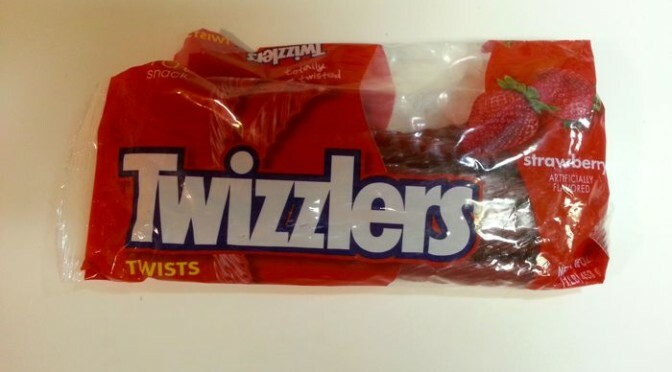 There was one item that was always in our cart; Twizzlers. We’d eat them on the way home and listen to college football on the radio. Even when I turned 14 and hanging out with your parents “wasn’t cool” I still continued to go for two reasons. First, I had my learners permit and got to drive. The second reason you can probably guess. It was for the Twizzlers! Now, whenever our family goes on a trip I make sure Twizzlers are a part of the road snacks. When you think about it Twizzlers really are a good “car candy”. The don’t melt as easily as chocolate and they’re less likely to get lost under seats or in cushions. Twizzlers to me are Saturdays in Fall, listening to football on the radio, grocery shopping, and learning to drive. 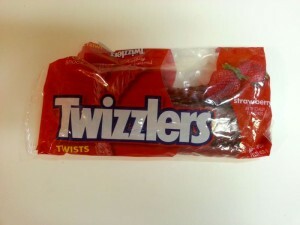 Do you have your own memory of Twizzlers or is there a certain candy that reminds you of part of your childhood? My childhood memory of candy is the drug store in Colfax. In the door to the right was the candy shelf. On the bottom were lots of different kinds for a penny or 2 for a penny. Every other Saturday night we would go to Colfax for my piano lessons and to get groceries. When I was done with my piano lesson I was to walk down to the grocery store to meet mom. Then I would ask permission to go to the drug store and spend some of my allowance on candy. My favorites were probably the butterscotch drops, but there were also lemon drops, peppermints, root beer barrels, and probably some I don’t remember.